Welcome to G&A Roofing Services in London. 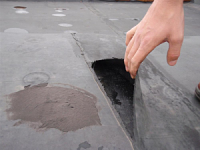 Our professional engineers provide a complete flat roof leak detection and testing service in London . We utilise specialist, non-invasive, electronic leak detection equipment that accurately detects any leaks or loss of integrity in your waterproof membrane on your flat roof. Our leak detection engineers can even detect tiny leaks without causing damage to your London flat roof. Once our leak detection survey has been carried out, our engineers will provide you with a comprehensive, detailed and unbiased report accurately highlighting the areas of concern with complete documentation to enable you to exactly pinpoint the areas that need repair or renewal. Our leak detection engineers in London are skilled in analysing the data from the leak detection equipment to give you an extensive and factual report that you can rely on. This can often save you money as you need only fix the specific problem areas and not have to renew your entire flat roof. Our engineers enable our customers to make informed choices about their flat roofs and their repair. Our expert leak detection engineers in London also use thermography as an additional tool to locate hidden leaks. Using a thermal imaging camera, our London engineers can detect the precise location of any leaks. Thermal imaging is a leak detection system that works by showing temperature differences that indicate where leaks are originating from without the need to use invasive techniques and without damage to your flat roof. This method of leak detection is also able to cover large areas in a short space of time and are an invaluable tool for our leak detection experts in London. This entry was posted in Leak Detection and tagged detection, flat, leak, leaking, leaks, London, roof, roofing. Bookmark the permalink.